On July 21, 2012, Mommy Mundo is holding a big, happy party for all expectant moms and dads. Through the first ever BELLY BLESSED FEST, a festival for Moms to be, set in a hippie, carefree mood, to spread peace, love and happiness all around! The festival opens at 11am, set at the Activity area of Bonifacio High Street fronting Nike. There will be a special area where expectant moms can have their portraits by Baby Shower Studio, there will be hip tie-dyed onesies stations by St. Patrick, a healthy snack bar by Slice Café and Del Monte Pineapple juice, and medallion making activity for preggy mamas. Live Music by Gentle Universe, a percussion show, interspersed with informative talks and demos by pioneer childbirth educator Rome Kanapi, prenatal yoga by Monica Manzano, a breastfeeding-themed activity by Candice Yaw of Mommy Matters, Babywearing talk by Denise Bernardo of Indigo Baby,and an actual belly dancing performance by JIll Ngo and the Goddesses of Belly Dance, talks on healthy pregnancy by Anmum Materna and GSK, as well as talks on modern mom concerns like cord blood banking by Cordlife. 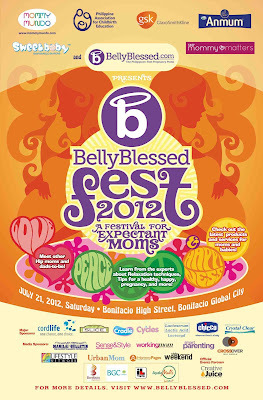 The event will also mark the launching Mommy Mundo's portal for pregnant moms, www.BELLYBLESSED.com. Through this new website, Mommy Mundo hopes to continue to spread its advocacy for maternal health and healthy and informed pregnancy. We invite all expectant moms to be part of the BELLY BLESSED FEST and celebrate the miracle that comes with pregnancy and birth! 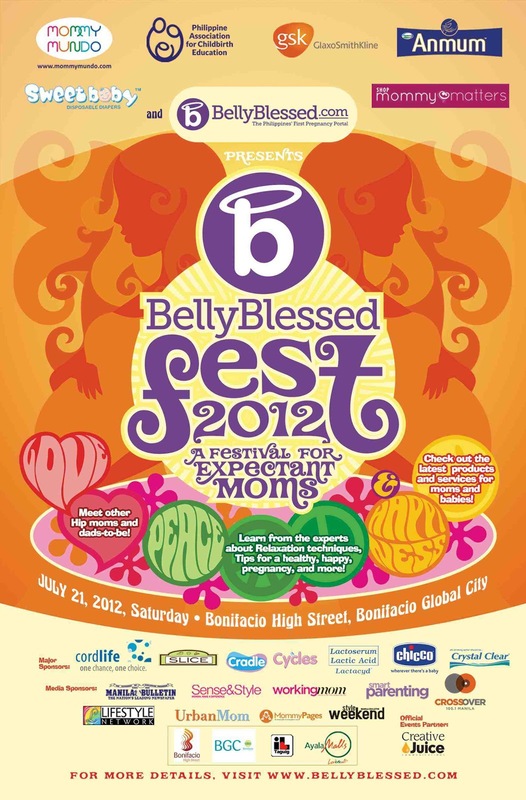 Belly Blessed Fest is presented by Mommy Mundo, the go-to resource portal for active, modern moms, PACE, Shop Mommy Matters, Glaxo SmithKline, Sweet Baby Diapers and Anmum Materna. The event is supported by Cordlife Cord Blood Banking, Cycles Mild Detergent, Cradle, Lactacyd Baby Bath, Chicco, Crystal Clear, and Slice Café. Media Partners are Manila Bulletin, Sense and Style, Style Weekend, Working Mom Magazine, Lifestyle Network, Smartparenting Magazine, Urban Mom Magazine, MommyPages.com.ph and Crossover 105.1. Official events partner is www.CreativeJuice.ph. For more detailed information, like Belly Blessed on Facebook or visit www.bellyblessed.com. *The first 200 pre-registered pregnant mommas will get a complimentary Belly Blessed swag bag! Text now at 0918-9300313. Final registrants must receive a confirmation text which they should show at the venue entrance.